Trained at Duke University, Dr. Ballentine is a medical doctor, herbalist, Ayurvedic practitioner, homeopath. Drawing on 30 years of practice and medical studies this brilliant book is a cause for celebration for anyone interested in learning about different schools of Eastern and Western healing traditions. 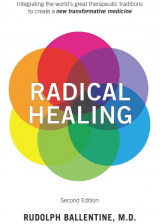 Radical Healing presents practical, well proven techniques for self-healing and transformation, inspiring case histories and specific tools, that help us go beyond labels (infertile) and give us a wide range of options. The notion that our personal healing is part of a global process of healing becomes quite clear as we journey toward our own Truth with this remarkable handbook. For anyone looking to validate the idea of optimizing your inner healing system this is a double must read. Although this book is a classic, I find that many people even if they have read it at some point, have not really utilized it to its fullest. In order to do that you will want to read and reread it for inspiration and as a source of ongoing guidance for the rest of your life. 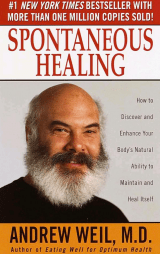 Through discussion of topics such as, “Protecting Yourself from Toxins, Seven Strategies of Successful Patients,” and through case histories of his patients, Dr Weil gets us to appreciate the incredible self-healing mechanism within the human body.